I have already introduce to you Kampung Fried Rice/Nasi Goreng Kampung? Today, its another one of our Malaysian dish. A veg dish. 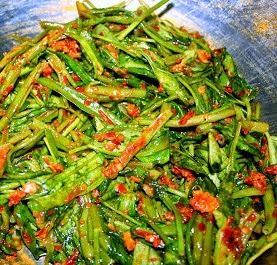 Kangkung Belacan or water spinach stir fried with belacan. What is belacan? Shrimps fermented in salt. Like petai (Sambal Bilis Petai), you either learn to digest the smell and taste of belacan, or no matter how hard you try, its still a no-go for belacan. Up to you. After all? What is a food pleasure to one, may not necessarily be for others. But for this typical Malaysian lady? Belacan. No way I can say no to belacan though you can't eat belacan just like that. Belacan is actually one of our Malaysian cooking ingredients. A tiny bit definitely goes a long way due to its saltiness and when cooked alongside the rest of the needed ingredients like for this Kangkung Belacan, oh-my. Malaysian hunger throne. Just kangkung belacan and a plate of rice? A major food deal personally for me. 1 bunch of kangkung (Water Spinach)- cut off the roots, pluck the leaves, slit and cut the stems. Get a large wok (kuali) and heat oil. All ingredients goes in except kangkung. Fry and stir till aromatic and oil splits. First, add the stems. Cook and stir for 1 min. wow navneetham... thx for the comment. the dish is really nive to get eattg the veggies. Nice info on foot care in the previoyus post....Hope u had a nice easter.